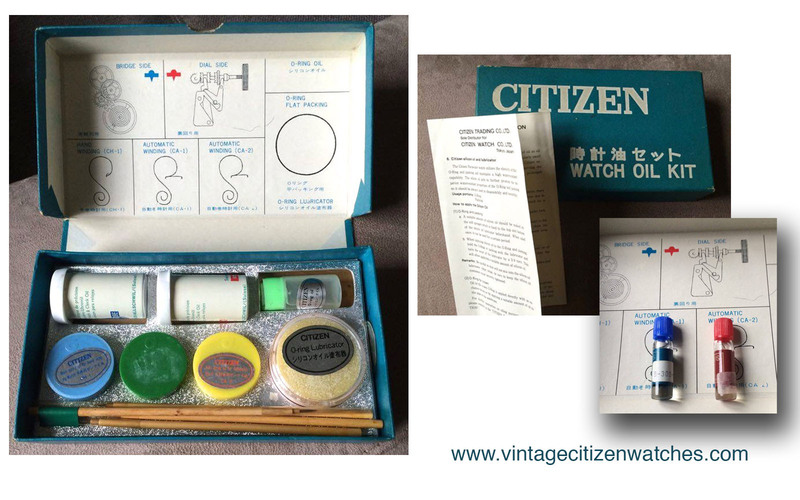 My friend Hako was kind enough to provide me these photos of an interesting collectors item, the vintage official Citizen watch oil kit, used for servicing the movements. Thank you Hako! Apart for the oils themselves, the kit has brushes and a booklet with instructions for using the items found inside the box. I will write the information written on it below. Citizen has designated the following 6 types of oil as oil to be used for Citizen watches. These oils particularly excel in quality and performance. Be sure to use the Citizen exclusive watch oil on Citizen watches for preserving the superior performance of the watch during a prolonged period. Since it is a compound oil of superior performance, there is no worry of the characteristics becoming inferior due to deterioration, aging, etc., regardless for it being used for a prolonged time. Usage portion: Dial side train wheels, jeweled pallet fork, escapement. Remarks: Use the oil by transferring a small amount to the saucer of the stand type oiler. Be sure to clean the saucer and replace the oil at least once a week even though the saucer is not dirtied. Similar to the Synt-A-Lube Oil, it is a compound oil of superior performance. The viscosity is higher than the Synt-A-Lube oil. Usage portion: Bridge side, day and date mechanism and second hand stopping device. Remarks: Same as in Synt-A-Lube oil. The Citizen watch oil CH-1 is a mixture of special grease and special solid lubricant and there is no worry of the characteristics becoming inferior due to deterioration, aging, etc., although it may be used for a long period of time and a stabilized mainspring torque is maintained constantly. Use the exclusive brush with blue color mark on application of oil. The Citizen watch oil CA-1 guarantees a stabilized slip torque which is particularly important for automatic winding an has been developed so a stabilized mainspring torque is maintained and used also on parts of the train wheels. The mixing rate of the solid lubricant differ from that of the Citizen watch oil CG-1. Usage portions: Part of train wheels. 150*, 220*, 140*, 24**, 060*, 03**, 11**, 41**, 52**, 54**and 64**. Use the exclusive brush with green color mark on application of oil. The Citizen watch oil CA-2 has been developed particularly for use on Citizen automatic wrist watches which have their mainspring torque increased. Its composition differs entirely from that of CA-1 and is a compound oil excelling in stability with no oil flows and is suited for heavy loads. Usage portions: Automatic winding mainspring. 72**, 74**, 76**, 77**, 66**, 65**, 60**. Use the exclusive brush with yellow color mark on application of oil. The Citizen Parawater watch utilizes the elasticity of the O-Ring and packing and maintains a high watterresistant capability. The silicon oil acts to further promote the superior waterresistant proprieties of the O-Ring and packing so it should be always used in disassembly and assembly. a. A suitable amount of silicon oil should be soaked in the soft sponges which is fixed to the top and bottom of the silicon oil lubricator beforehand. When oiled once, it can be used for a certain period. b. When applying silicon oil to the O-Ring and packing, hold the o-Ring or packing with the lubricator and turn the cover of the lubricator by a 1/4 turn. This will allow applying a suitable amount of silicon oil. Remarks: Be careful so dust will not mix into the silicon oil lubricator. After usage, be sure to keep the silicon oil container cover securely tightened. Oil to the crown O-Ring is applied directly with an exclusive brush or by applying a suitable amount of oil to the pipe of the watchcase. I am sure you will love the info and the pictures, just like I do. It is always nice to discover new things about our passion: watches, Vintage Citizen Watches. Read more interesting facts about Citizen HERE. 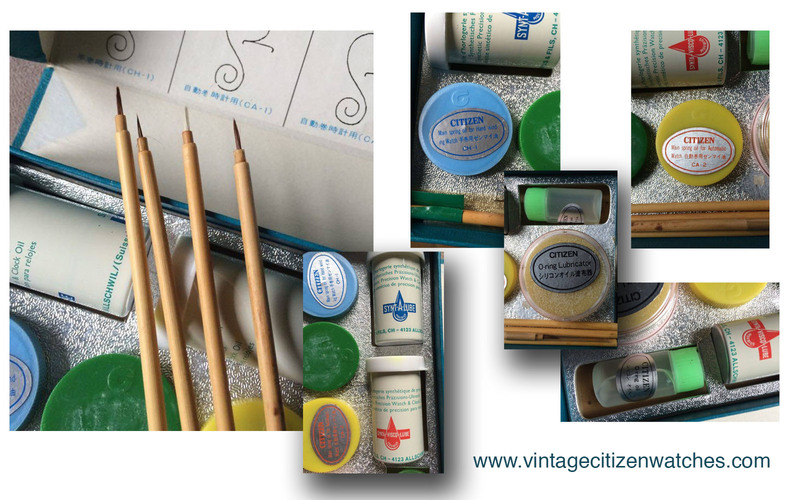 This entry was posted in automatic, Citizen history and data, hand winding, Uncategorized, vintage Citizen and tagged citizen oil kit, oil kit, service a citizen watch, service a watch, vintage citizen, vintage citizen watch, vintage watches service, watchmaker. Bookmark the permalink.